Only discovered in 1989 during the historic Voyager 2 flyby, Proteus is actually the second largest Neptunian moon and the largest of the inner moons. Proteus was named, like all the moons of Neptune, after Greek or Roman mythology characters associated with Neptune or Poseidon! Fast Summary Facts About The Moon! Name: From Greek mythology, Proteus is the shape-changing sea god! More Cool & Interesting Facts About Proteus!! Unusually despite being the 2nd largest moon orbiting Neptune, it was only the third moon discovered. 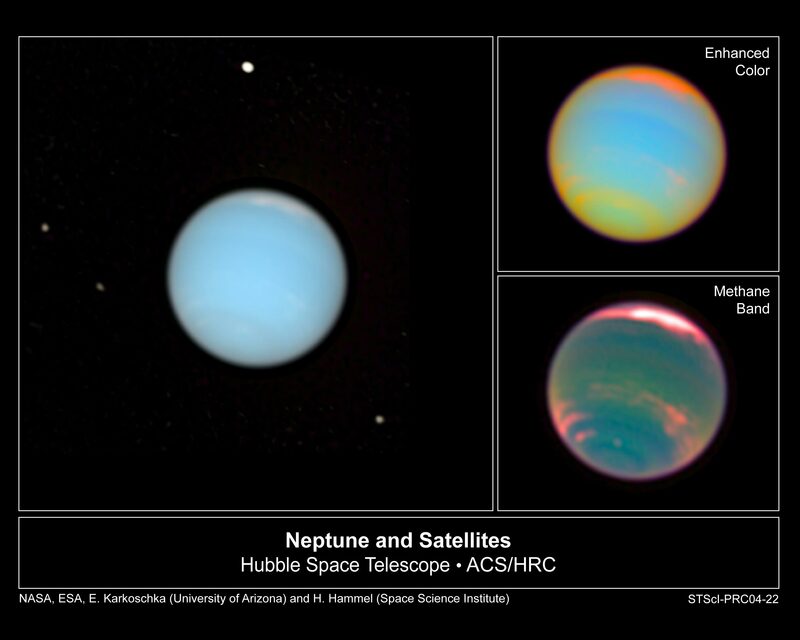 The smaller Nereid was discovered 33 years early using an Earth-based telescope. Neptune’s small moons are some of the darkest objects in the solar system, reflecting only 6 – 10 % of the sunlight that reaches its surface. Similar to lumps of coal! Crazy! 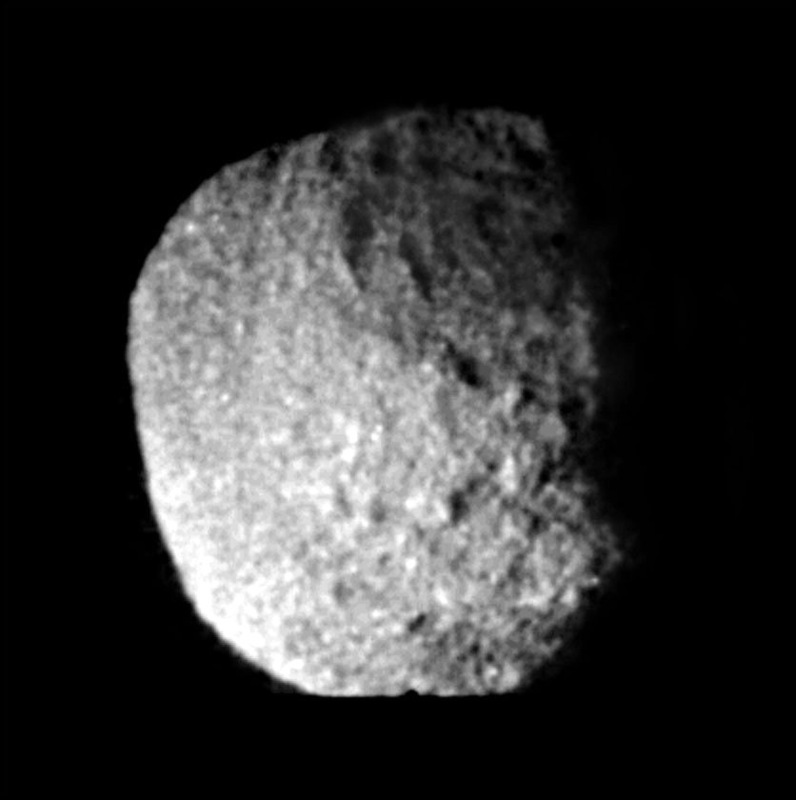 On account of Proteus being so dark and orbiting so close to its bright planet (and hence it’s glare) was likely the main reason the moon was discovered after the more distant Nereid. The irregular shape (which resembles a kind of box) and cratered surface, with no evidence of geological processes, suggests it’s been a cold rigid body since its formation. Interestingly, with its estimated density of 1.3g/cm3 scientist believe it’s about as big as an icy body can be without its own gravity pulling itself into a spheroid. The Saturnian moon Mimas has a similar composition, but is smaller in size yet has an ellipsoidal shape! This is likely due to Mimas experiencing higher temperatures and tidal heating. Like most moons in the solar system, Proteus rotates in a prograde direction around the primary body (Neptune) above its equatorial plane. Also like nearly all moons that orbit close to their planets, they rotate synchronously – i.e. 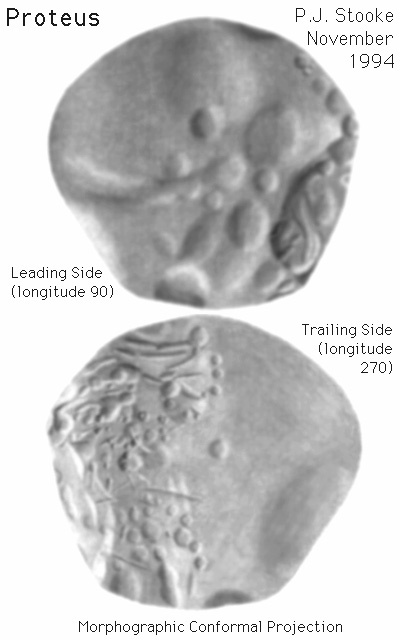 they are tidally locked so the same side always faces the planet! Just like Earth’s Moon! 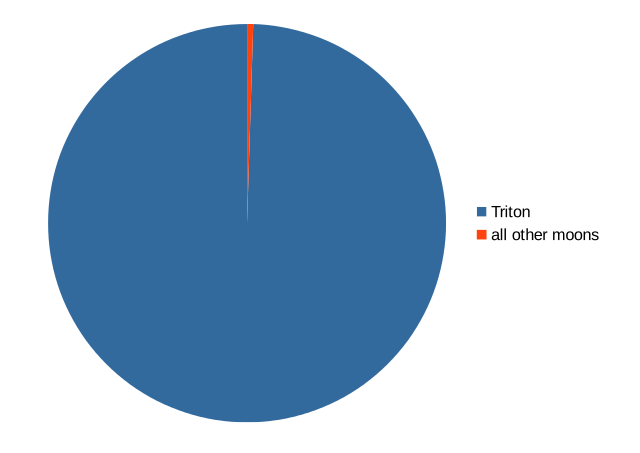 It’s not known for certain, but scientist suspect that Proteus is in all probability, not an original moon that formed when Neptune did; it likely accreted later from debris created when the massive moon Triton was captured into Neptunian orbit.